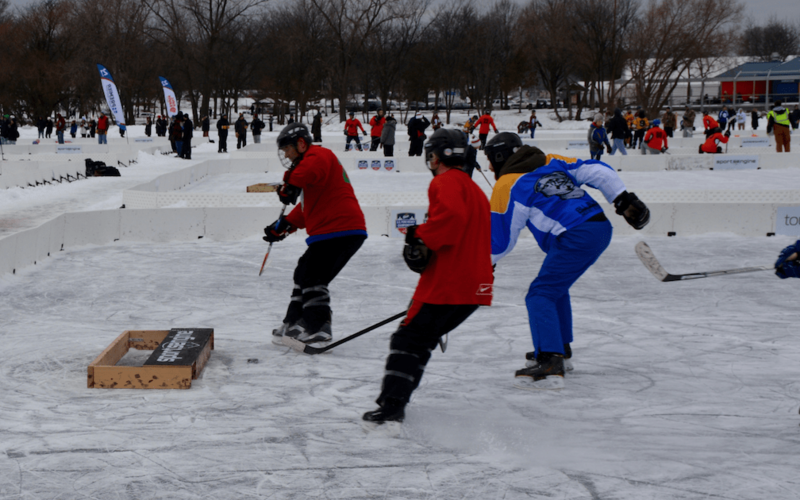 Some 12 years ago, a PR executive named Fred Haberman developed the concept of a tournament for pond hockey that was ultimately named the “U.S. 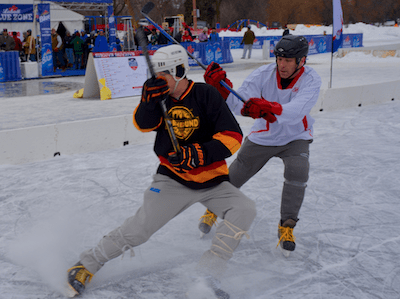 Pond Hockey Championships.” The event is now owned and organized by the Sports Ngin folks – creators of sports websites for community sports associations – continues to grow in popularity. Remember there’s no goalies and no nets. The wood pallet structure serves as the goal. 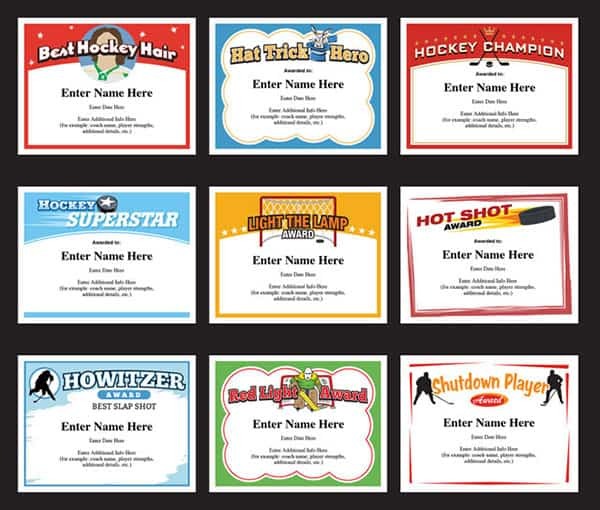 Player shoot into two 6″ x 12″ slots on the right and left side of the front of the piece. Note the ice fishing shelter behind the rink to the left. 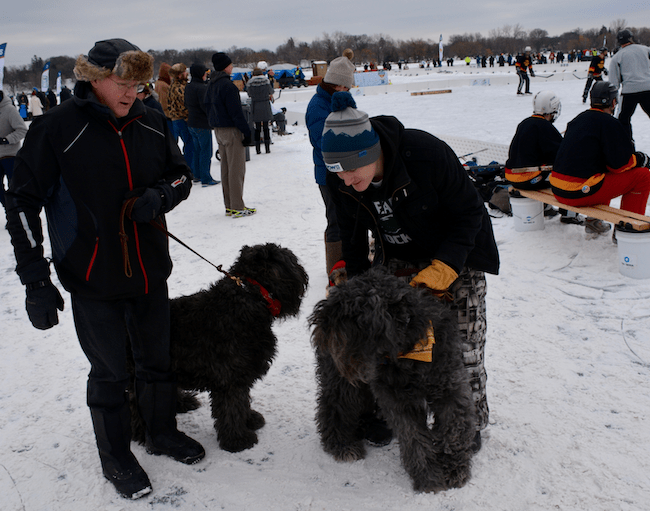 Playing pond hockey in Minnesota, Wisconsin or in many parts of Canada is a time honored tradition. Many professional hockey players grew up on pond hockey and it was there that they honed the skills that would enable them to make a living playing a game they loved. For most others, pond hockey is on the expense side of the household ledger, but a sport that generates fond childhood memories. Many still enjoy trying to lace up the skates and find a way to get back out on the ice. Playing 4-on-4 with little protective gear and no goalies would make even the Hanson Brothers proud. It opens up the game and brings out the creative play that is sometimes lost when coaches get involved. A professional game, or even a high school game, with 6 players on the ice from each team can clog up the passing lanes. 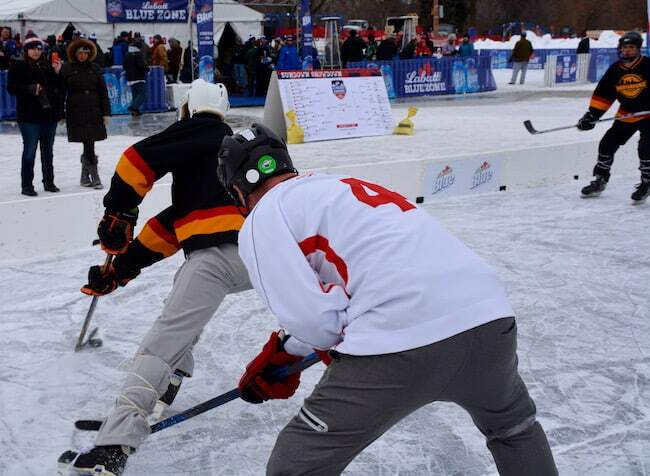 The free-styling play of pond hockey helps players develop a sense of creativity. And, with more puck touches, a youngster’s hockey game can improve rapidly. 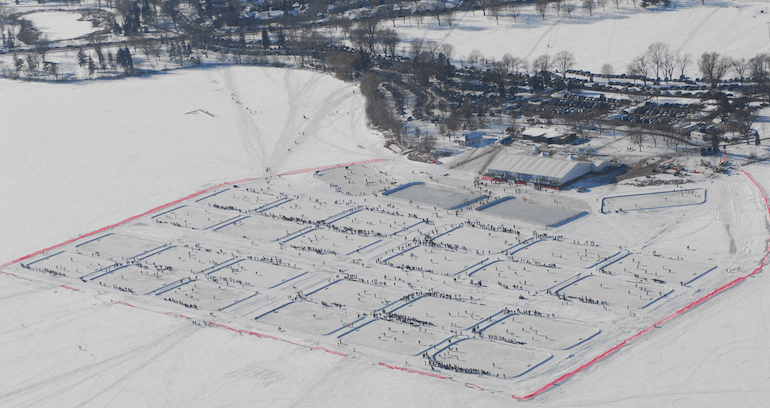 24 rinks ready for the U.S. Pond Hockey Championships. Photo from U.S. Pond Hockey Championships. Playing hockey “the way nature intended”, has been a hit with sponsors (this year’s title sponsor is LaBatt Blue), fans and with players. Players come from across North America, and one player even came from England, to take part in this event. Most of the players are Minnesota natives, and while amateurs, typically at least some high school hockey experience. Former NHLer Brian Bellows played in a past tournament after his 10 year career ended. Organizers even established a Free Agent Board for those players who want to play but can’t field a complete team. Spectators are right on top of the action. With plenty of games going on at one time, there’s lots to see. There were six divisions this year based on age, gender and level of expertise. All players had to wear helmets. There was one off-ice official at every rink. Although, I didn’t see any penalties called, it’s within their powers. 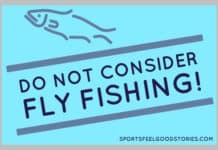 No checking. No slap shots. No goaltending. One game is played with two 15-minute halves. Players and teams compete for the highest award: The Golden Shovel. Whether players walk home with the shovel or not, undoubtedly, they bring back with them an experience from a sporting event that likely stirs up a few childhood memories. While the temperature was only 28 degrees on Saturday, it felt 10 degrees cooler on the lake with the wind. It didn’t stop a good number of spectators from enjoying the games. Heck, even 18 degrees in Minnesota isn’t always the gauge to wear the winter coat. Two minutes for tripping. Whether you’re at Lake Nokomis or Bell Centre, this merits a tripping call. There’s no such thing as bad weather, just bad clothing options. 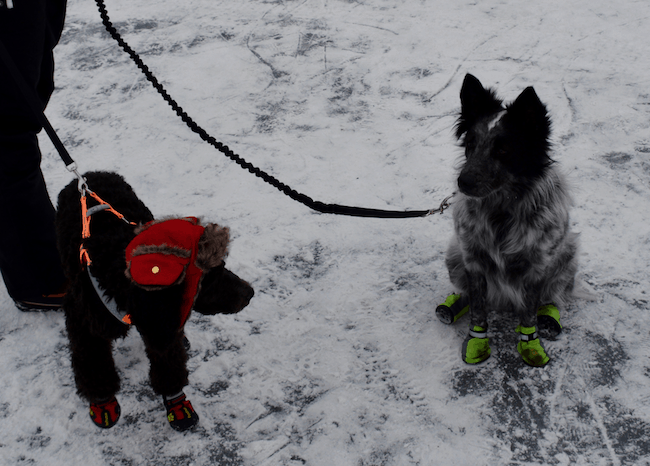 These two – with the bomber hat and snow boots – were ready.